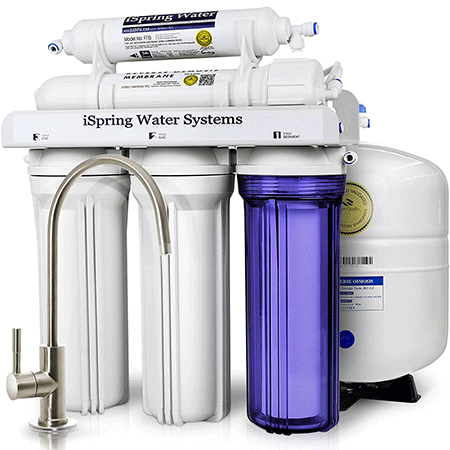 Reverse osmosis water filters remove chemicals and germs found in many water sources, including regular tap water. These foreign compounds get into your water from local water supplies, main water lines, and household plumbing. Filtration systems relying on reverse osmosis create pressure differences inside different chambers, forcing water through filters to clean it. Most products employ several filters that include fine membranes or layers of sediment, such as charcoal. These technologies let reverse osmosis filters give you water that tastes better, and is cleaner, than water filtered through other methods. The RO150 is a portable three-stage filter for indoor and outdoor use. You can change the ratio of how much waste water is produced relative to fresh water, varying the operational speed. A built-in pressure gauge lets you measure the water pressure entering the system. The small RO150 can be wall-mounted, so it can be placed near hoses and easily moved from front to back yards, a plus for anyone gardening with filtered water. The EcoPure ECOP30 is a sink system that is installed out of sight and directly into the plumbing. The system’s storage tank and faucet provide filtered water from a tap. The storage tank delivers a high capacity, so it can provide enough clean water for a large household. An alert light on the faucet reminds users when to replace their filters. 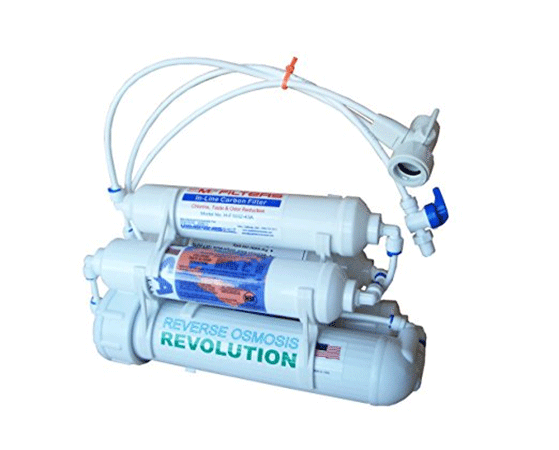 The Reverse Osmosis Revolution System can fit inside kitchens with tight quarters, from apartments and dorm rooms to recreational vehicles. The product hooks up to the faucet directly through a flexible hose. 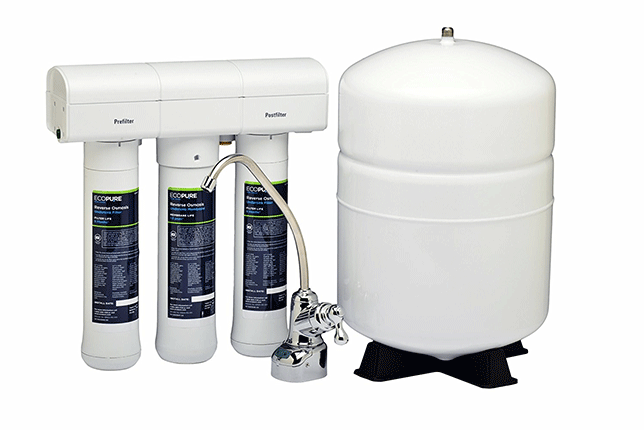 This filter system removes a wide range of contaminants for its size. At five pounds, it weighs about half as much as other portable filters, increasing its convenience. The RO-505 is another large system placed under sinks. It storage tank can be attached to an included faucet. Extra filters come with the system, which is a nice bonus. The RO-505 can be installed fairly quickly. The modular design of the filters makes for simple replacement. APEC’s four-stage RO-CTOP is a countertop design. The straightforward design allows users to set up the filter in most faucets. The RO-CTOP functions well within a range of water pressures. The 90 gallon per day output exceeds the amount of water filtered by other countertop systems. 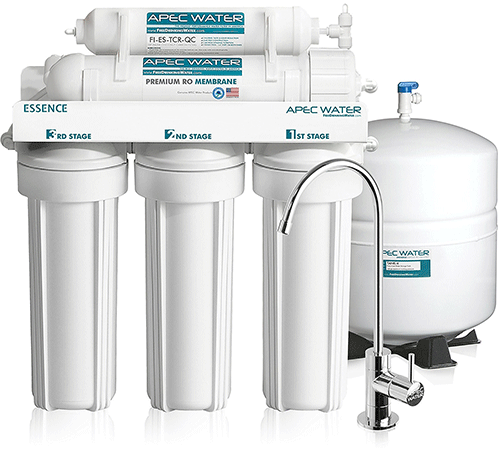 The APEC reverse osmosis water filter system known as the Essence ROES-PH75 contains more filtration stages than most comparable under the sink models. A large storage tank can be used to hold filtered water. The system adds calcium to the water automatically to regulate pH. The ample storage tank and high pressure faucet will satisfy most household users. The tank also helps offset the 75 gallon per day filtration capacity. The RO5DX model by Express Water can fit under most sinks, but has a slightly larger storage tank capacity than similar models. The filter system permits rapid cartridge replacement without discarding the housing, reducing waste. The RO5DX removes thousands of impurities, and filters out higher proportions of these compounds than smaller household models. The filter color coding helps when changing filters. The Ultimate RO-90 by APEC can be installed beneath sinks, and has a chrome faucet and plastic tank. The five-stage system makes use of independently certified filters. 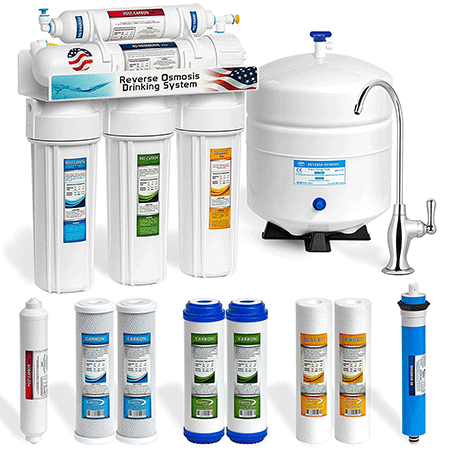 RO-90 filters have longer lifespans than many other systems and dispenses water quickly. Our runner-up, the Essence ROES-50, is another sink system. 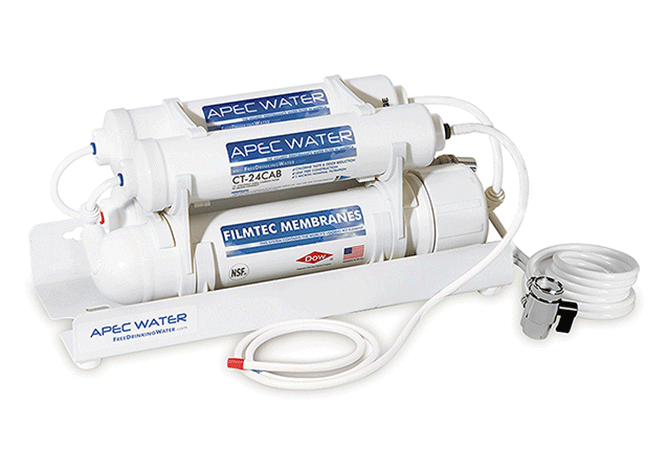 It stands out because of its dual-sized filters, and fitting-free tubing seals. The filter sizes permit faster filtration alongside longer usage times. 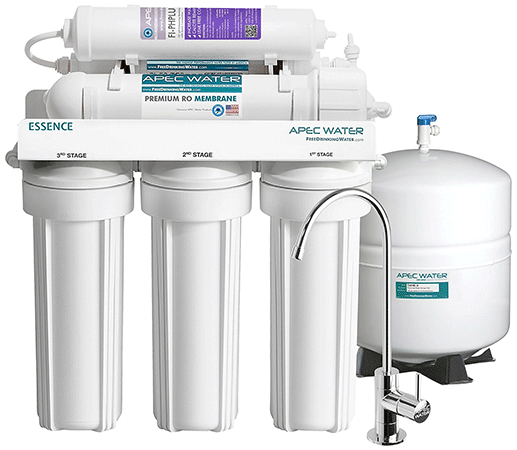 We chose iSpring’s RCC7 as the top reverse osmosis water filter of 2017 for its unique post-carbon filter, pressurized storage tank, and balance of effectiveness and filtration speed. The fine membranes used remove nearly all contaminants from water. The RCC7 automatically detects leaks and fills the storage tank only when needed. 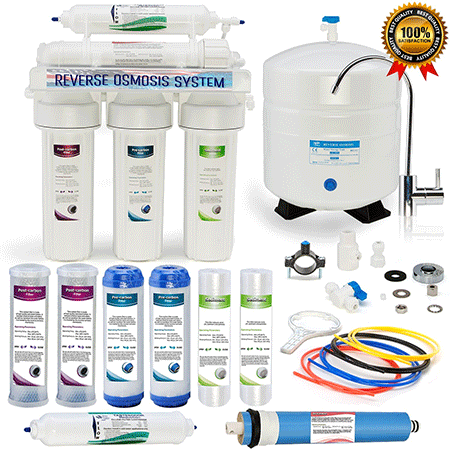 Filter Types: The “stages” of reverse osmosis water filters refer to a given product’s number and types of filters. 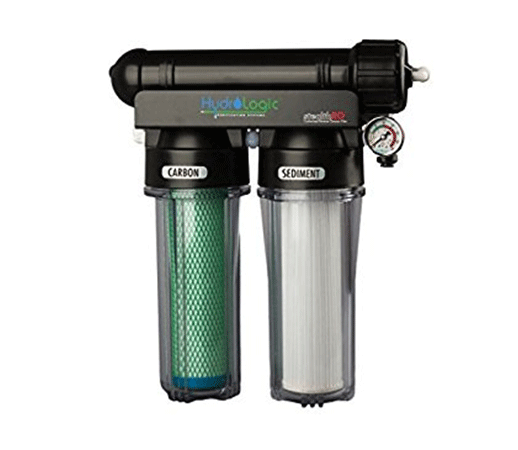 Different filters remove specific contaminants, like chlorine, lead, and bacteria. Some kinds of impurities can pose larger problems depending on where you live and where your water comes from. Old apartment buildings might carry a risk of lead in the water from outdated pipes, while well water should be screened for microorganisms. Size: Reverse osmosis water filters come in many sizes, such as portable models that may be taken outside for gardening, and countertop systems designed to fit smaller kitchens. You may put larger devices beneath a sink, and those units usually come with storage tanks for pouring water with no delay. 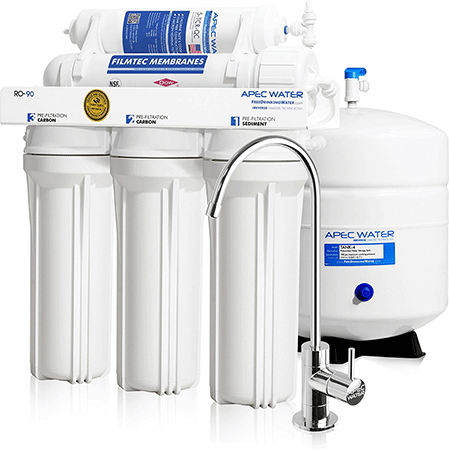 Convenience: Some filter systems boast easy installation and pure water merely by turning the tap, but have lower filtration capacities and require you to wait while your water goes through the system. Other reverse osmosis filters take longer to install and operate, but their storage tanks offset any wait times, and have larger daily capacities.